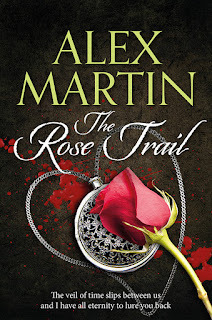 Alex Martin - In The Plotting Shed: The Rose Trail is published! I'm very excited to announce that my new book, The Rose Trail, is now published! I do love a challenge and this book presented me with several. Not only was there a great deal of research for the historical section, there were five voices to convey. Fay is the narrator of the piece and a flawed and troubled character. Definitely not your average heroine. The germ of the idea for this story was born many years ago. I was working as a secretary in a legal firm and had to deliver a will to a house on the Wiltshire downs. With the errand achieved, I looked around the tiny village and felt drawn to one particular dwelling. It was a beautiful house, larger than a cottage, but nothing grand. 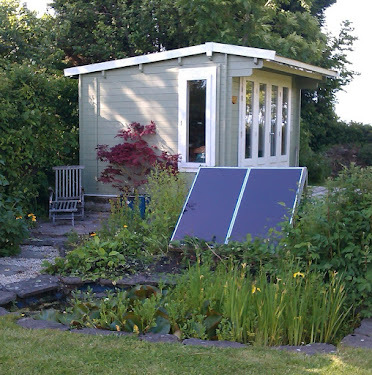 It was ancient but still stood, square and sturdy, basking in the sunshine and smiling across to the other houses skirting the village green. As I approached its whitewashed walls, I noticed it was empty. I peered in through the warped old glass windows, tucked deep under the thatched roof. Inside was a large room with a massive fireplace at one end. The floor was uneven, made of large limestone flagstones, glossy from the hundreds of feet that had worn it smooth over time. The ground floor was only one room deep and I could see straight through into the walled garden through the window opposite. Although the house was much humbler than the Meadowsweet Manor featured in The Rose Trail, it spoke to me of the era in which half the book is set, the English Civil War. I sensed a family at war with each other; conflicted and arguing, heard the clash of swords and the clang of armour. I remember vividly the chilling sensation that crept up my arms, making them spring goosepumps all the way up to my thumping heart. I knew then that I would never forget the place. I wondered if I had lived there before, in that war torn age, or perhaps I would live there in the future, with a family of my own. Neither scenario has happened, as far as I know, but the memory remains crystal clear in my mind. Instead of giving birth to children, the moment of seeing into the past has created a story. It is my fervent wish that I have done justice to the house that spoke to me that day so many years ago and that readers will enjoy the result. The paperback will be available very shortly - just in time for Christmas! Thank you Judith. I hope so!